The brand new British Womens Motocross Association tackled their critics. knuckled down and enjoyed a fantastic first season running the British Womens Motocross Championships, so we caught up with founder Howard Marriott for his take on year 1 of the series and what the plans are for the BWMA in 2018 & beyond. Hi Howard tell us about yourself and how you got into Motocross? I started racing Motocross back in 1976 with the YMSA, my dad, Ken Marriott, was secretary at the time and my elder brother was racing, when he was too old for the YMSA we had to go adult racing but there was nothing in Leicestershire at the time so my dad started a new AMCA club the Leicester Hunters. He helped grow the sport in Leicestershire and started two other clubs to cope with the growth, Coalville Moto and Shepshed Sporting all of which are still going today. I reached the expert class and won a few races, then stopped, had the kids and came back again, it was this second time that Vicky my daughter took an interest. Your Daughter Vicky rides, how long has she been racing? Vicky started late at 13, she played football for Leicester City under 14’s at the time but I would give her rides on my bike and she soon got the bug. Once she progressed from the 85cc I quit racing and bought her a CRF250 Honda. I coached and trained her and she soon mastered it and loved the sport. Unfortunately she had some bad injuries including a brain hemorrhage which was touch and go as to who she would be when she came out of it, but fortunately there are no after effects and she continued to progress, breaking a few bones along the way. It seems like the British Women’s Motocross Association has been in the offing for sometime, tell us how your vision came about? It has been difficult for Vicky to progress, we did a round of the ACU British Championship and loved it, so looking forward to doing the following season, but they cancelled it, so the only thing for the girls to do was the two day girls nationals at the end of the year. The only thing for the girls was the Scott Nationals which Vicky did for a year in 2015, but she had to race in the same class as either the 250 two strokes and they were fast and ruthless, or the Vets, or the IMBA. In 2016 she went to register for the Scotts but the girls class was full at 14 riders so they could race in the same class as the men. There was no way this had the girls interests at heart so we did the IMBA which involved a lot of traveling. All the girls kept saying how they wanted their own championship so, probably with my dad’s attitude, and after the last two years trying to find a series for her to race just against girls I thought well let’s start our own Championship. We have been following the Association and the first year of the British Womens Motocross Championship from it’s inception, how hard was it to get it off the ground? To be fair it wasn’t too bad once I sorted the structure. We discussed this at length and although to be fair this has come a bit late for Vicky now she is 25, I didn’t just want to put on a few races for the girls, I wanted to create a structure where the young girls can see a realistic pathway to becoming World Champion. This meant linking up with the AMCA. The reason behind that was simple, we would never get enough girls to make a girls meeting viable but we could go to AMCA clubs and say will you put on a race we can bring along a good number of riders. The crucial thing though is the IMBA, The top 5 could represent GB, in the IMBA team and gain valuable European racing experience, the top 12 could experience it at our home round, this invaluable experience would make the step to GP’s a lot easier. How was the series been received by the riders? The support has been overwhelming not just from the riders but also from their families who put so much into it. My absolute goal is to produce a British World Champion, we have done well with Bethany Farmer this year. We are close to an IMBA Champion. Both Beth Farmer and Chelsea Gowland scored the highest ever position for a British Girl in an IMBA with 3rd places, with the right support for the girls an IMBA Champion is on the cards, and then wouldn’t it be great if a BWMA British Champion became World Champion. It will happen. There were a few people who weren’t sure of the series, do you think the success of this year has won them over? I hope so. We have done everything we can to create a massive opportunity for the girls to work towards, to facilitate them reaching their full potential, and we are working on so much more to help them realise their dreams. This is the only genuine Womens Championship where the girls race head to head with no male riders getting in the way, our top five will be experiencing European competition some at the young age of only 16 years old, what an experience that is for them. The best female motocrosser in the UK is the British Champion, this series settles that score. Your involvement in Womens Sport seems to be transcending beyond Motocross tell us about your links with Women in Sport? Vicky and I are attending the Women in Sport conference on Wednesday 18th October on the stage with the England Womens Football team, the Womens Rugby team and cricket team along with the top echolons of Womens sport to try and raise the profile of Womens Motocross. I am so proud to have our British Champion Beth Farmer alongside us, her first official engagement as British Womens Motocross champion and we will be doing our best to try and get more recognition for all our girls. We hope to make some good connections and see if we can get more support for the girls and the sport. There seems to have been great camaraderie between the British riders taking part in the IMBA European Championships, that must be great to see? The IMBA is a massive thing. The girls genuinely represent Great Britain, all the teams wear their countries shirts and it gives the girls a massive experience, racing against some of the best European ladies including former World Champion Steffi Laire, a great benchmark. They experience the traveling, being in a foreign land and being part of a team. Great camaraderie and friendships are built. This is a great stepping stone making the GP’s a little less daunting for the most ambitious of racer. This year again was a superb year for Great Britain, when Bethany Farmer finished 3rd overall at Switzerland pushing her up to 5th overall in the final standings. The BWMA British Champion also now the highest placed British girl in the IMBA. I know there are huge plans for the future, what is changing in 2018? For 2018 we are introducing a Youth 85cc class. This is key to the structure we talked about earlier so young girls can see that as they grow up they can progress to the Open Class British Championship, they can see the top girls and talk about their IMBA experience and also the girls that have gone on to do GP’s. This is how we are going to produce World Champions, they can see a way to the top. We will be running 8 rounds including one in Scotland to give our Scottish friends a home round which I think is fair. We are so pleased as well that our title Sponsor Westerman International are again supporting us with prize money and help. Again we have massive support from Bel-Ray who support the super popular Bel-Ray Holeshot prize for each race and they will be doing this for the 85cc Youth class as well. We have a new sponsor Proactive Solutions, who are sponsoring the fastest lap championship. Both the Holeshot and the Fastest Lap will encourage girls if they can’t win they can still improve, go for the holeshot, try and put in a fastest lap and you will be rewarded. We are creating a new division of the BWMA 382MX Racer Development Program, this is where we actively help the girls and support them in finding support and sponsorship for the International careers. We are actively looking for an IMBA team sponsor to help with the traveling costs. We are also working with British Championship rider Josh Spinks to run coaching days to give the girls as much help as possible to again realise their dreams. So lots of things going on. What is the plans for the longer term? The long term goal is to have the BWMA televised, to have the British girls recognised by a wider audience but to continue to build the structure so we reach our goal of facilitating a British Womens Champion to be World Motocross Champion. For this we need more businesses that share our belief and passion and get involved by helping with sponsorship. Tell parents and riders how they can get involved and what they should expect from being a member of the BWMA? We will be open for registration beginning of November, go to www.bwma-uk.com for more information, go to our facebook page or just get in touch with me or Vicky. It will be the best experience you will have racing, and if you are serious about being the best we are series about giving you the best opportunity and support to get you there. INTERVIEW: 2018 British Womens Motocross Champ Chelsea Gowland. Gowland and Elliott take titles! 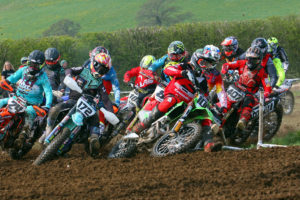 British Womens Motocross Championships – Season Round up!